The esports company finally made an esports-worthy peripheral. The esports company finally made an esports-worthy peripheral. We took a look last year at the Fnatic Clutch G1 gaming mouse, and I was not impressed. When Fnatic got in touch to send us its second-gen Streak keyboard, I wasn't expecting much. And yet the Fnatic Streak is, as of this moment, probably the best bang-for-your-buck RGB keyboard on the market. Quite a turnaround. For an esports company, Fnatic sure is good about reining in its designs. I know that's because these are technically made by Func, the Swedish company Fnatic acquired. It's remarkable how minimalist and distinctly not "Gamer" the Streak looks. Aside from the RGB lighting, the Streak looks like a keyboard you could bring into the office unapologetically. The corners are all rounded off, the branding is fairly tasteful, and the chassis itself is made from a dark-gray aluminum. For a keyboard with few defining traits, the Streak still somehow manages to look unique, and surprisingly high-end. I think the Mionix Wei still takes the prize for "Gaming Keyboard That Most Looks Like A Boutique Keyboard," but the Streak isn't far behind. The Streak pairs minimalism with utility, though. For instance, it's one of the only keyboards I've seen with a hardware button for "Function Lock." Disable it, and your Function keys work like normal F1 to F12. Enable it, you get access to the secondary commands—six macro keys, on-the-fly lighting adjustments, a window preview key, and media keys (Back, Play/Pause, Forward). Then there are a handful of dedicated media controls in the top-right section. The half-size volume wheel is a bit small in my opinion, but it works as advertised. Then there are controls to quickly mute or unmute both normal audio and mic audio—a very esports-centric feature, but one that's pretty cool for people who play lots of multiplayer games. This block also features a key for "Competition Mode," similar to the Game Mode keys you'll find on Razer, Logitech, and other keyboards. It disables the Windows key as expected, but also changes the lighting from the default rainbow to a static orange color, dims the backlighting slightly, and disables any preprogrammed macros. Holding down the Competition Mode key also lets you program macros without downloading Fnatic's software, a nice touch. The wrist rest looks pretty generic at first, but has its own genius design touch. At first I thought "Wow, it's so small." It's only about two inches deep, and was barely long enough for my hands to rest on at all. Or was it? Turns out, the wrist rest is actually two pieces. A metal backplate connects into the keyboard itself, but the padded top portion lifts off and can be replaced in three different positions. It's not as plush as Logitech's or Razer's recent wrist rests, but it's surprisingly comfortable once set it up properly. But it's a smart backlighting trick I'm most impressed by. See, Cherry MX RGB keys have a problem: The central "stem" design requires the accompanying LED to be offset. Look at Corsair's keyboards, or HyperX, or even a Cherry knockoff like Razer—you'll see the text on every key is raised to the top. That's where the LED shines through. Fnatic flips it, though. Taking cues from Das Keyboard, the Cooler Master Storm Stealth, the WASD Code keyboard, and more, the Streak front-prints the Function keys. F1 to F12 are emblazoned on the facing edge, with the secondary functions on top. Fnatic then flips the orientation of the switch underneath so the LED is at the bottom, thus lighting both the F1 to F12 labels and the secondary functions, without cramming them all together on top. It's a trick only keyboard fanatics (ha) will appreciate, but now that I've seen it I hope it crops up on other keyboards. It's slick, and an elegant solution to the problems presented by Cherry's stem design. Speaking of which: The Fnatic Streak does indeed use time-tested Cherry MX keys. That puts it in rarefied company, at least among gaming keyboards these days: Corsair, G.Skill, HyperX, Cougar, Fnatic. Off the top of my head, those five companies are the only ones still using proper Cherry RGB switches instead of knockoffs or custom in-house designs. In any case, the real coup here is the price. Proper Cherry boards typically have a reputation of being more expensive, but somehow Fnatic is selling the Streak for a mere $130. 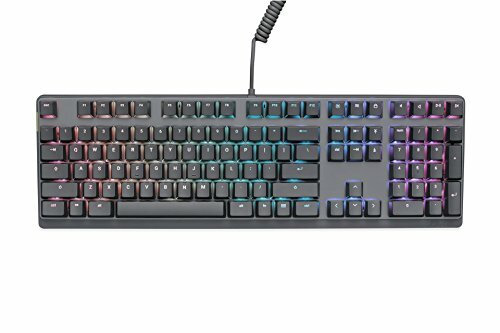 That's not quite as cheap as Cougar's Attack X3 RGB, our budget RGB board of choice, but the Streak adds a lot of great features—standalone media keys, a comfier wrist rest, the Function Lock button, separate game and chat mute buttons, et cetera. It's also prettier, in my opinion. An extra $30 for that much functionality? More than justified, I think. In fact, I'd probably choose the Fnatic Streak over a lot of the $150-170 tier keyboards I've used. It's that good. It's what I would've expected from Fnatic the first time, honestly. After all, this is an esports organization making its own gear for esports competitions. You expect it to be pro-tier quality. After the Clutch G1's dismal showing though, I was worried Fnatic was just cashing in on trends. Not so worried now. The Fnatic Streak is a keyboard that punches well above its price, with a durable aluminum chassis, reliable switches, and a whole host of smart design tricks that make this second-gen refresh a clear winner. This story, "Fnatic Streak RGB review: A gaming keyboard that punches well above its price" was originally published by PCWorld.